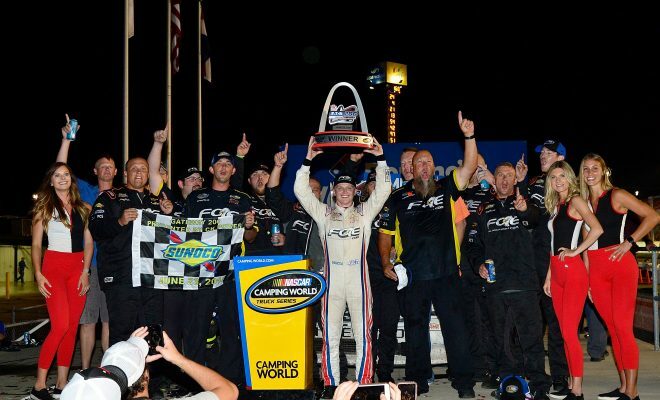 (via NASCAR Wire Service) MADISON, Ill. – In a chaotic final 10 laps of Saturday night’s fifth-annual Villa Lighting delivers the Eaton 200 presented by CK Power, Justin Haley withstood a green-white-checkered finish to score his first career NASCAR Camping World Truck Series victory in his 37th career start for GMS Racing. Haley held off a hard-charging Todd Gilliland to secure the organization’s fifth Truck Series win of the season but more importantly stamp his No. 24 Fraternal Order of Eagles Chevrolet into the Playoffs. “I’ve been dreaming about this since I was a little kid,” said a jubilant Haley in Victory Lane. “Every time you start doubting yourself you get in a situation like this. I’m about to cry man, that was amazing. Gilliland scored a season-high runner-up finish after clearing Johnny Sauter on the Lap 158 restart. “I’m pretty happy with where I finished,” Gilliland said. “I guess I need to communicate better what I think I need for the race. The track just changes so much in these trucks compared to the K&N cars. It’s just about keep bringing fast trucks to the race track every week and our finishing positions keep moving up. Haley swiped the lead from Noah Gragson with seven laps remaining as Gragson, Haley and Gilliland all battled for the top spot. The caution waved on the restart lap for the stalled truck of Ben Rhodes which set the tone for the Lap 158 restart. Gragson, who led 53 straight laps prior to the restart, had to pit for damage with Gilliland, his Kyle Busch Motorsports teammate. He recovered to finish 10th after leading a race-high 63 laps. Before the late-race chaos, the opening two stages were relatively calm. ThorSport Racing’s Grant Enfinger won his first pole of the season and led every lap in Stage 1. Christian Eckes in his second Truck Series start for Kyle Busch Motorsports inherited the race lead for the start of Stage 2, as his team pitted during a Lap 34 caution, putting the Greenville, New York, native in control of the field for the Lap 42 restart. Despite his inexperience, Eckes powered away from the field in his No. 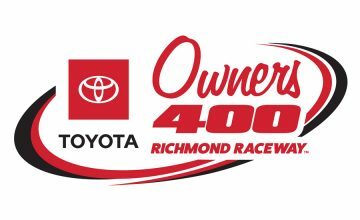 46 Mobil 1 Toyota, dominating Stage 2 by leading every lap. Gragson grabbed the lead off pit road at Lap 71 after a two-tire stop jumped him three positions for the Stage 3 restart. 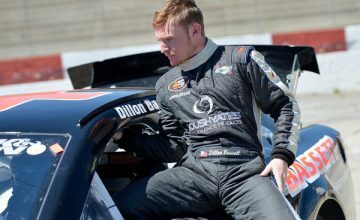 The Las Vegas native controlled the field until an incident at Lap 110 when second-place runner Nemechek suffered a puncture in his oil tank, leaking fluid and soaking the 1.25-mile racetrack with oil, causing Justin Fontaine, running ninth, to lose control of his No. 45 Niece Motorsports Chevrolet entering Turn 1. Tate Fogelman, in his Truck Series debut, also found himself a victim of the circumstances and t-boned Fontaine. Both drivers climbed from their trucks under their own power and were later evaluated and released from the infield care center. The field endured a 12 minute and 36 seconds red flag period for track cleanup. Eckes’ impressive night ended on Lap 77 after contact with Stewart Friesen sent him into the Turn 2 outside wall. With significant damage to his No. 46 Kyle Busch Motorsports Toyota, the 17-year-old was unable to return to the race and was credited with a 28th-place finish. “I feel fine. It’s just unfortunate,” said Eckes. “These guys worked really hard today and brought me a really fast truck. It was definitely good enough to win. We won a stage. It’s just unfortunate. The Truck Series concludes a four-week consecutive stretch of competition at Chicagoland Speedway on Friday, June 29 with the running of the Overton’s 225.